I grew up on Carrot Pudding. I have to tell you, it is REALLY good. We never ate it for dessert, though. It is one of the staples of our Holiday Dinners as a vegetable dish. I have now brought it to my husbands family, and they love it. Heat the ghee in a large wok. Add the grated carrot and salt to the ghee. Saute the carrots for good 20 minutes on low heat until the carrots are soft and ghee starts to release. Now pour in the milk and let it come to boil on medium heat. 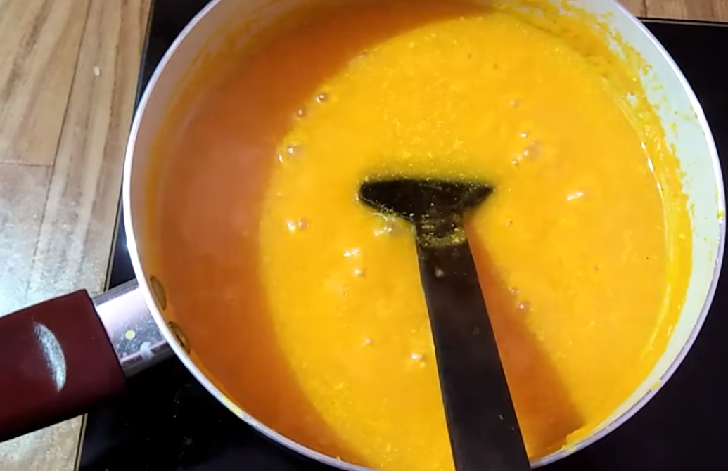 Once the milk starts to boil, reduce the heat to minimum and cook uncovered until all the liquid milk evaporates and the milk solids get infused with the carrots. This would take good 30 minutes. Then add the condensed milk. Stir to mix everything well. Let the condensed milk come to a simmer. Cook until the carrot thickens. The consistency should be quite thick with hardly any liquid visible. Once done, sprinkle the cardamom powder and turn off the flame. Cover and let it sit for 15 minutes. Serve warm sprinkling the toasted nuts on top of each serving.